“So Is Your Old Lady.” Words by Al Dubin, music by Joe Burke (1926). Recorded by Elsie Carlisle with piano accompaniment by Carroll Gibbons on May 25, 1926. Ariel 940 mx. Bb8427-1 (also on Zonophone 2757 and Ariel 1006). 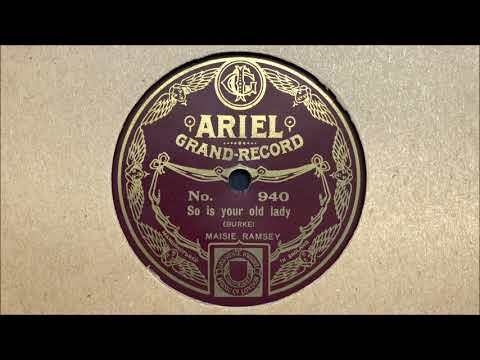 Other versions of “So Is Your Old Lady” were done in 1926 in America by the Original Indiana Five, Ruth Etting, and Warner’s Seven Aces. In Britain the song was recorded by Jack Hylton and His Orchestra, Teddy Brown and His Café de Paris Band (with vocalist Lionel Rothery), Bert Firman (under the pseudonym of Newton Carlisle’s Dance Orchestra), Hilda Glyder, Victor Sterling and His Band (directed by Nat Star), and the Edison Bell Dance Orchestra (with vocals by Tom Barratt).